Last night, Vanderpump Rules viewers saw the return of Crazy Kristen. Kristen Doute even drunkenly fell onto a table after receiving a text about guys night from her man Brian Carter. Through the unintelligible slurring It was not clear what Carter actually texted her, but does it even matter? Not only that, but Kristen also had some misplaced anger over James Kennedy returning to DJ at Pump. Of course, none of these are actually related, but it all comes back to projection. Right? That’s especially true on reality TV. Last night was the first time Carter has appeared on an episode in forever and it wasn’t even with his own girlfriend. He was at guys night with the rest of the men in the cast. Meanwhile, the female cast members exposed their relationship issues. Stassi Schroeder even called Carter out for not paying any bills. James Kenndy 2.0, much? Why is Kristen always in a sugar mama situation? In December 2018, Andy Cohen announced that he was expecting his first child. It was a total surprise to the Bravo fandom. Just six weeks later Andy welcomed his son Benjamin Allen Cohen (and his full head of black hair). It really was a whirlwind for his fans. Now they want to know more. The new father did not make the choice to become a single parent lightly. Recently, Andy discussed his decision and why it was the perfect time for him to begin his journey into parenthood. New dad and Watch What Happens Live host, Andy Cohen made the trek back to New York with baby Benjamin Allen. Andy had been staying in Los Angeles prior to Ben’s February 4 birth to be readily available when his surrogate went into labor. After a few days of California sunshine, it was time for the guys to return to NYC. Andy packed up his Daddy gear, his baby, and hopped on a private plane (PJ!) for the journey home. Because everyone has an opinion, he is receiving backlash on his method of transportation. Is it February 12 yet? I’m eagerly anticipating the premiere of Lisa Vanderpump vs. Everyone. Ummm, I mean Real Housewives of Beverly Hills Season 9. There has been so much gossip during filming, The fans just want to know the truth! Kyle Richards, Lisa Rinna, and Teddi Mellencamp Arroyave were on Watch What Happens Live last night. If they weren’t talking about Lisa Vanderpump, they were just waiting for a chance to bring her up. 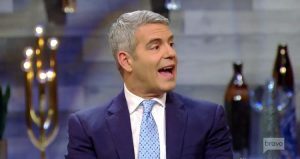 Then again, Andy Cohen was the one stirring the pot. I mean asking the questions. He wanted them to mention LVP. Clearly. 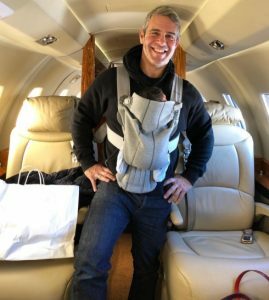 Now that Andy Cohen has someone else to call him Daddy, is he already making plans for more kids? When Benjamin Allen Cohen was born on February 4, Andy’s life went from after-hours cocktails to after-hours formula. Furbaby Wacha now has to compete for Daddy’s attention! The new father has been receiving lots of support from his family of Housewives, who are all shining examples of motherhood waiting to share their knowledge on the dos and don’ts of child-rearing. As most parents know – minutes after your child arrives, people begin asking when you’re having more. So is there a brother or sister in Ben’s future? According to the host of Watch What Happens Live, it depends.